Here is a boat from a company in Florida that is very new to me. It’s a good-looking boat that would make a nice dual-purpose boat for a small family. Freeboard is on the high side but that buys interior volume. The ends are very truncated and that too buys interior volume. The D/L is 162 and the L/B is 2.69 indicating quite a beamy boat. Draft is 5 feet 1 inch. 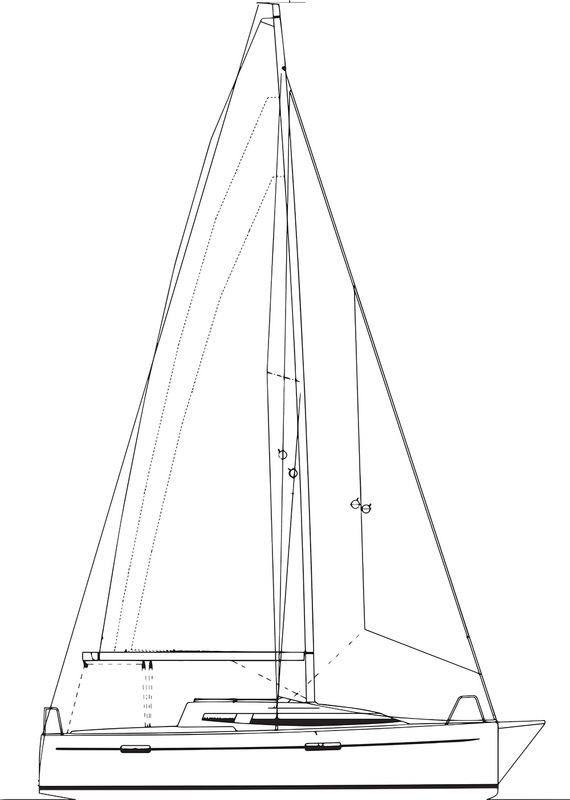 There is a single, high-aspect spade rudder and a T-configuration keel with bulb. The Wahine group appears to have had a lot of experience with high-performance boats so I would be optimistic and say the new model will be a good performer. I had to go back and double check the LOA of this boat when I saw the interior. This is quite a layout for a boat just shy of 26 feet LOA. I am impressed with the usable head and the generous galley space. There is even a wet locker in the head. Nice. The starboard settee is chopped off but not by much and a youngster could still sleep there comfortably. The quarterberth is huge. This boat is about a foot longer than my Perrywinkle but it has a much nicer interior. It’s tough to work a usable, enclosed head into a boat this size but I think for family cruising it is required. The galley is often an area shortchanged in boats this size. Not so in the Wahine Lifestyle. There is even counter space aft of the stove. There are several fixed glass windows in the cabintrunk that will let in a lot of light. The engine is tucked under the companionway. This is a very good layout. The SA/D of the Wahine is 21.25. That’s a healthy rig capable of driving the boat nicely in light air while not overpowering it too soon. The single spreaders are swept 25 degrees. A short integral sprit gets the asymmetrical chute away from the headstay to make jibing easier. It’s easy when you are “yacht dreaming” to dream big. It sure sounds good. But there is a lot of fun to owning a small cruising boat. The Wahine would make a great starter cruising boat that just might last you a long time. LOA 26’; Beam 9’7”; Draft 5’; Displ. 5,071 lbs. ; Ballast 1,430 lbs. ; Sail area 473 sq. ft.; SA/D 21.25; D/L 162; L/B 2.69; Auxiliary Yanmar 12-hp sail drive; Fuel 10 gal. ; Water 30 gal.